Recently, I tried to make a peanut butter pie that was more of a pastry cream filling, you know, without cool whip. Alas, it didn't set up in the fridge. But lo, when I put it in the freezer? 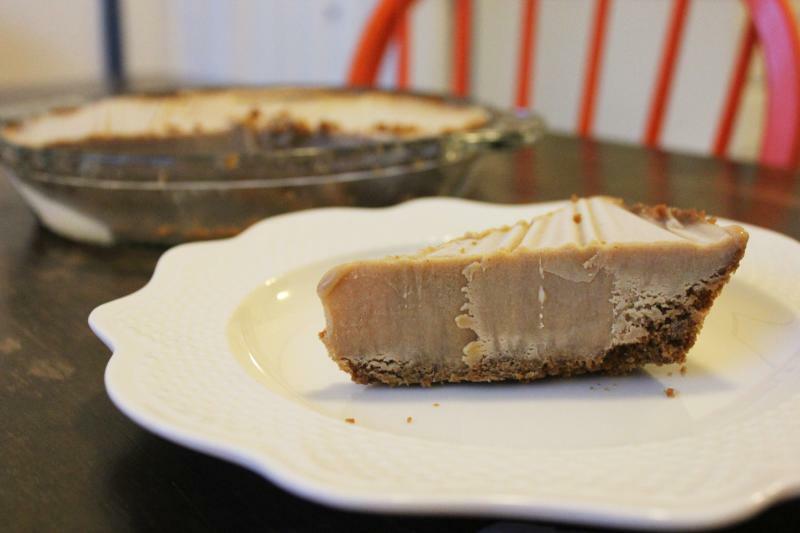 What do you know - I actually made peanut butter ice cream pie! Yes, mistakes can sometimes turn into wins! I was actually quite sad at first that it did not set up. And if you would prefer a pie that is less ice cream and more pastry cream, you just need to cook your mixture on the stove a bit longer until it really starts to thicken up. But if you're as big of an ice cream fan as I am, that won't be an issue. You can totally just eat this pie without any topping, but I had also made some marshmallow fluff/creme and figured it might just be a great idea to put some on top, for a bit of fluffernutter action. Because peanut butter and marshmallow go together extremely well. But, of course, you already knew that. I mean, just look at that. Can you resist that combination of peanut butter, ice cream, graham cracker and marshmallow? I think not. This pie is sweet without being cloying, and the fact that it's frozen into ice cream actually makes that happen. In case you didn't know, sweetness is harder to taste when things are super cold, so that's why ice creams are always so full of sugar - so that you can taste it! Perhaps this pie would've even been too sweet if it set up like it was supposed to? Regardless, it's quite delicious as an ice cream pie! Enjoy! 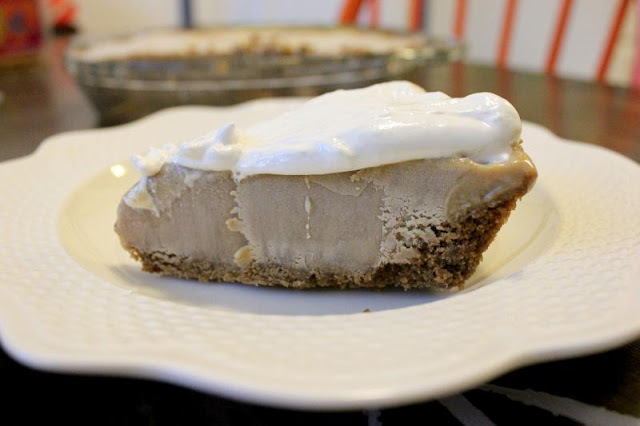 Not overly sweet, this peanut butter ice cream pie will satisfy both peanut butter and ice cream lovers. If you want the marshmallow fluff topping, make that first. You can make it ahead of time and stick it in the fridge until you want to use it. Directions are here. Now, make your crust. Preheat your oven to 350°F. 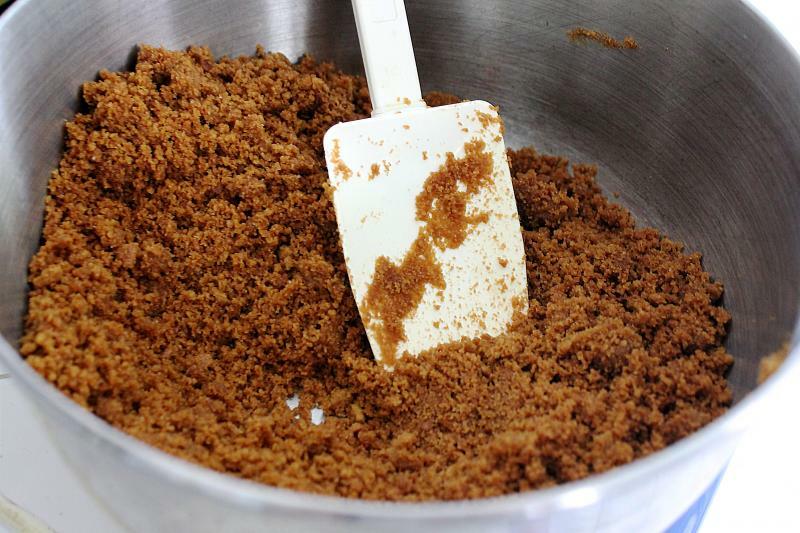 In a medium bowl, combine your graham cracker crumbs, sugar, and butter. If you end up using something like the Trader Joe's graham crackers, which already have cinnamon and sugar in them, don't add the extra sugar, you don't need it. Anyway, pour your crumb mix into your pie pan and press firmly with your hands, making sure to press all the way up the sides. Using a measuring cup, press the bottom firmly. Then, bake for 15-25 minutes until golden brown. Cool completely on a wire rack. This will take at least an hour, so plan accordingly. Next up, the peanut butter ice cream filling. In a medium bowl, mix together 1/2 cup cream or milk, and cornstarch. Set aside. Pour your remaining milk/cream and add in the sugar in a medium saucepan. Cook over medium heat until it just starts to bubble. Whisk in the eggs and egg yolks into the milk and cornstarch mixture until well combined. Carefully add in about 1/3 of the hot milk mixture to the eggs while you are whisking, to temper the eggs. Once it's warmed up, pour that egg mixture into the hot milk in the saucepan. 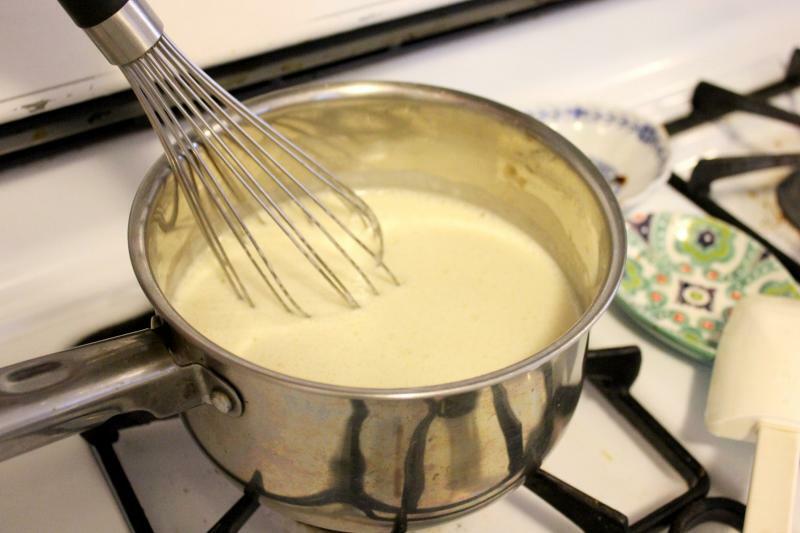 Over medium-low heat, whisk constantly until it just starts to thicken, coating the back of your spoon, about five minutes. 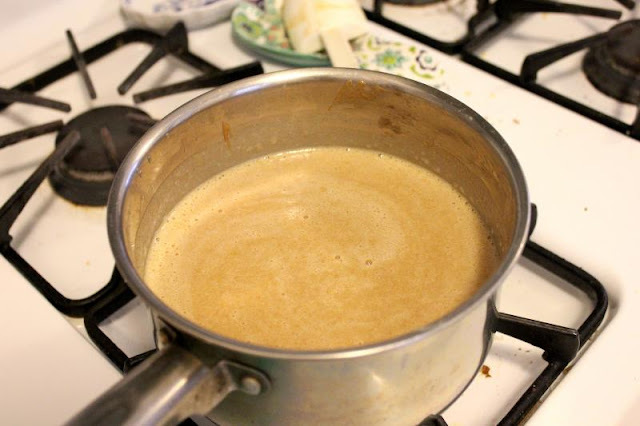 Remove from the heat and whisk in the peanut butter and vanilla until all combined. 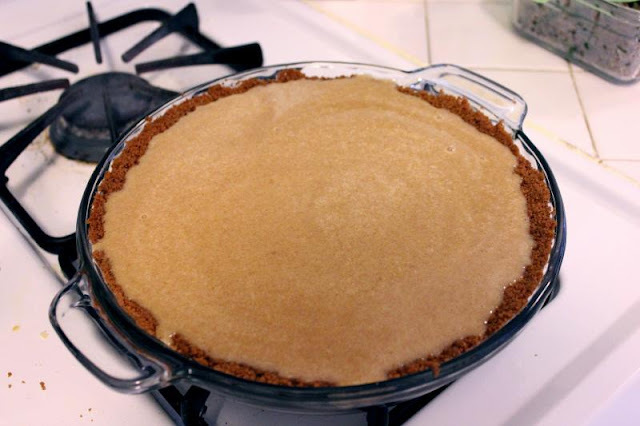 Pour the peanut butter filling into your pie crust, cover with saran wrap, and stick that in the freezer for eight hours or overnight, until it has firmed up. If you are so inclined, before you cut it up, spread some of your marshmallow creme over the top to make it a fluffernutter ice cream pie. If you are only going to eat a few pieces, I would recommend just spreading the creme onto the individual pieces as I'm not sure how it would freeze on the top. Because yes, you definitely need to keep whatever leftover pie there is in the freezer. Since it's ice cream pie and all! 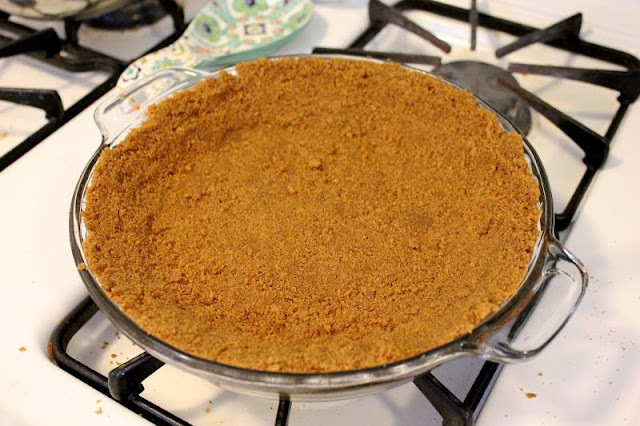 Press those crumbs into your pie pan. This is a 10-inch pie pan and it was the perfect size. Bake at 350F for 15-25 minutes until golden brown. Let cool COMPLETELY before you do the rest. It will probably take about an hour. 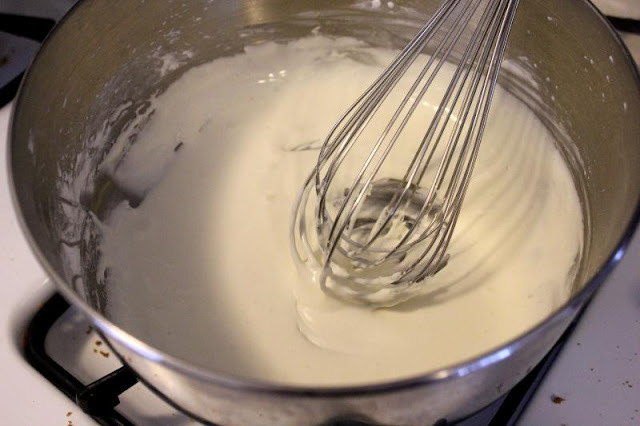 Whisk together 1/2 cup milk/cream and cornstarch in a medium bowl. Set aside for now. 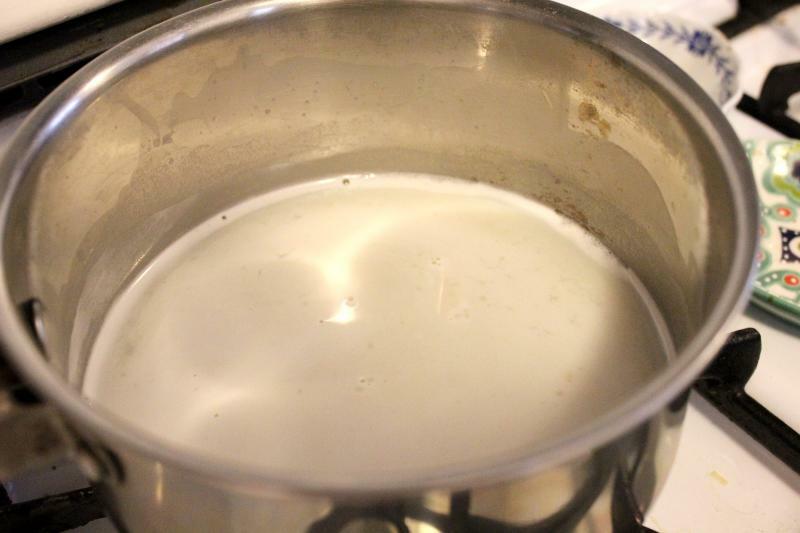 In a medium saucepan, cook on medium high the remaining milk and your sugar until it just starts to bubble. 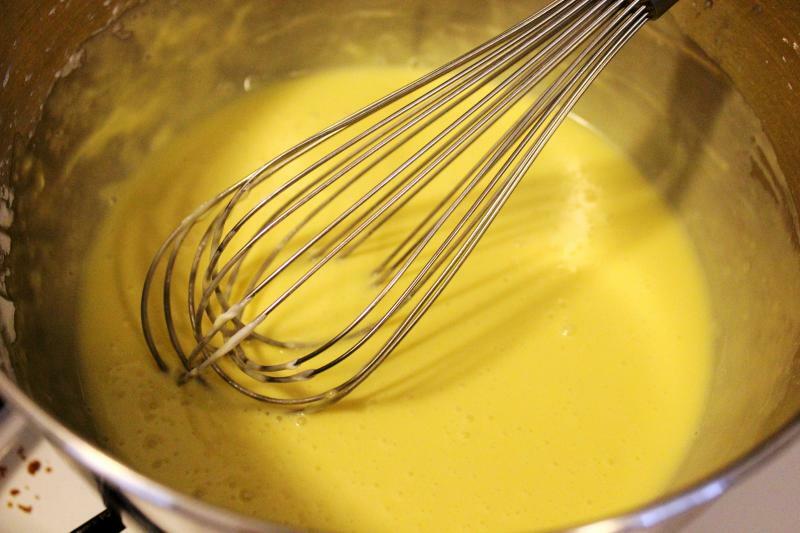 Whisk in your eggs and egg yolks into your milk/cornstarch mixture until well combined. You take a bit of the milk mixture and add it into the egg stuff and whisk, whisk, whisk. This is tempering the eggs so they don't just cook. Then, add that egg mixture back into the saucepan and cook on medium low until it just starts to thicken, coating the back of your spoon/spatula. This will take probably about five minutes. Take that off the heat and add in the peanut butter. Pour into the prepared pie pan, cover with saran wrap, and stick that in the freezer for 8 hours or overnight. Once it's frozen, you can cut 'er up and chow down. Or, if you're feeling so inclined, spread on your marshmallow cream. With the marshmallow cream on top!